As we saw in Chapter 1, Disraeli believed he had found in Cyprus, not an ideal base, but a geographical location in which he could further deter the Russians from expansion into Asia. The base did not materialise. The intended financial utility of the island was hampered by the subsequent failure to develop its infrastructure. 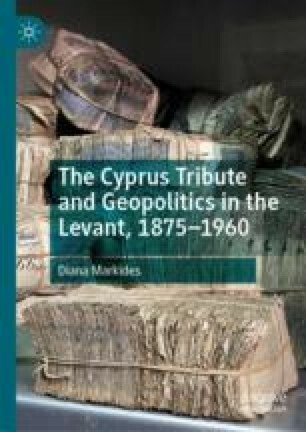 This epilogue observes the belated creation of a British base in Cyprus in the context of the cold war, long after the tribute had ceased to be an issue for the Cypriots. It follows the final redemption of the 1855 Crimean War Guaranteed loan in the aftermath of the island’s independence. Apostolides, A. 2010. Economic Growth or Stagnation during the Interwar Period: Reconstruction of Cypriot GDP, 1921–1938. MPRA Paper No. 21476, UTC https://mpra.ub.uni-muenchen.de/21476/. Esteves, R., and A. Coşkun Tunçer. 2013. Feeling the Blues: Moral Hazard and Debt Dilution in Eurobonds Before 1914. http://www.novasbe.unl.pt/images/novasbe/files/INOVA_Seminars/eurobonds.